Meudon Hotel & Garden is a 9 acre sub tropical valley with private beach created in 1800 by R.W Fox. It has a wonderful collection of rare and exotic trees and shrubs from around the world. 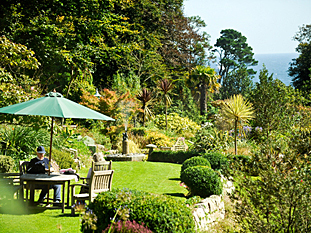 A South Cornish Hotel nestling on the coast in thickly wooded countryside between the famous ‘Packet’ harbour of Falmouth and the romantic Helford River estuary and close by Trebah and Glendurgan gardens and Frenchman’s Creek – areas made famous by novelists Daphne du Maurier and Rosamund Pilcher. 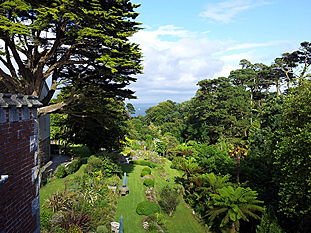 Meudon Hotel is a unique family owned and run luxury accommodation hotel set in a timeless sub-tropical hanging garden leading to its own private sea beach on Falmouth Bay at Bream Cove. Adjoining are the National Trust properties of Rosemullion, Chenalls and Nansidwell, all of us access the Cornwall coastal path. From here you can walk to Durgan, the Ferry Boat Inn, Duchy of Cornwall Oyster Farm and back to Mawnan Smith. One of the West of England’s best country house hotels. Enjoy free golf at Falmouth Golf Club, painting, photography, walking, bird watching, fishing, swimming, bridge, sailing and riding. Cornwall Calling! Although very English, Meudon takes its name from the nearby farmhouse built by Napoleonic prisoners of war and called after their eponymous home village in the environs of Paris. Formerly a private mansion built at the turn of the century, Meudon today incorporates two 17th century coastguard cottages, making an unusual blend of a gracious private house and a modern Cornish Country House Hotel, offering winter break holidays in peace and quiet, with its award winning Vine restaurant. Few hotels lend themselves more to the Christmas and New Year festivities, with free golf to work off the excesses of too much Turkey, sea food and Cornish Cream! The hotel was developed by Mr and Mrs Harry Pilgrim, and is now managed by their son Mark – the third generation hotelier in this lovely Helford river area. 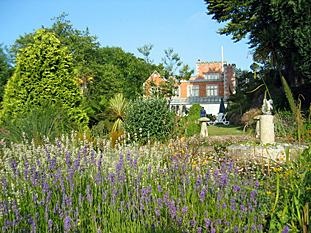 Standing amongst hundreds of acres of National Trust owned and protected coastal farm land, Meudon presents a haven of peace and beauty, while Meudon gardens, so wonderfully sheltered and warmed by the Gulf Stream, are widely acknowledged as one of the finest examples of a Cornish “hanging garden”. Our giant, first generation, Australian tree ferns were brought to Falmouth by ‘Packet’ ships as ballast and then thrown over the side into the bay. Rare shrubs, plants and trees abound and you will find Chilean flame trees, lantern bushes, gunnera (giant rhubarb), mimosa, eucalyptus, magnolia, camellias, fruiting bananas, splendid azaleas and rhododendrons, including Meudon and Meudon Vean – developed on the estate. Most of the huge flowering shrubs are at their best between March and June, then the more traditional summer flowers provide a rainbow of contrasting colours.